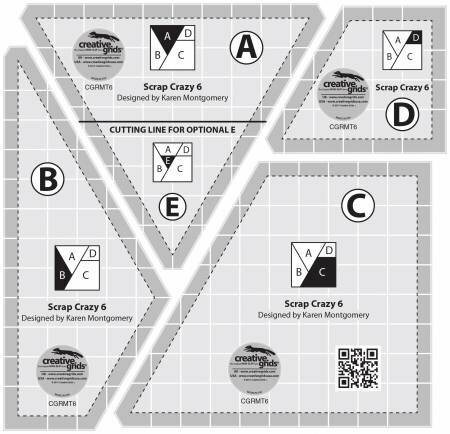 Create 6" finished Scrap Crazy blocks with the four templates in this set. All of the pieces can be cut from those odd-sized scraps in your stash or you can stack fabrics and cut multiples in a matter of minutes. The tips are trimmed as pieces are cut so the pieces sew together perfectly every time. Embellish the seams with your favorite decorative stitches and threads. Make an entire quilt or sew them into a scrappy, decorative border, wall hanging, purse, or tote bag. The templates slide easily over the fabrics until pressure is applied, thanks to Creative Grid's terrific "non-slip" design. Creative Grid's exclusive "gripper" holds fabric in place while cutting, eliminating slipping and mistakes! The template set comes with fully illustrated step-by-step instructions or quilters may scan the QR Code printed on the template to view a video demonstration.